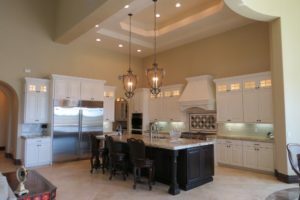 With 2018 proving to be the year of “personalization,” home owners are turning to placing lights beneath their cabinets for more atmosphere. If you decide to go that route, here are a few things to keep in mind to get the best effect without creating problems. LEDs are the best option for under-cabinet lighting for a number of reasons. They produce the least amount of heat, provide good lighting for activities and come in a variety of colors. Traditionally more expensive, costs have come down considerably recently. This, along with their long life makes LEDs a good choice for the long term. Fluorescent lights are almost as energy efficient as LEDs but they do produce more heat. Another option is Xenon lights that emit some heat but they can be dimmed to create an attractive, warm glow. Halogen lights are still possible but the heat they throw off can affect food or drinks stored above them. When selecting lights to go under your cabinets, determine what kind of effect you want but keep in mind what you plan to store in each of those cabinets.